Two men were arrested this morning after leading police on a chase that lasted for more than 30 minutes. 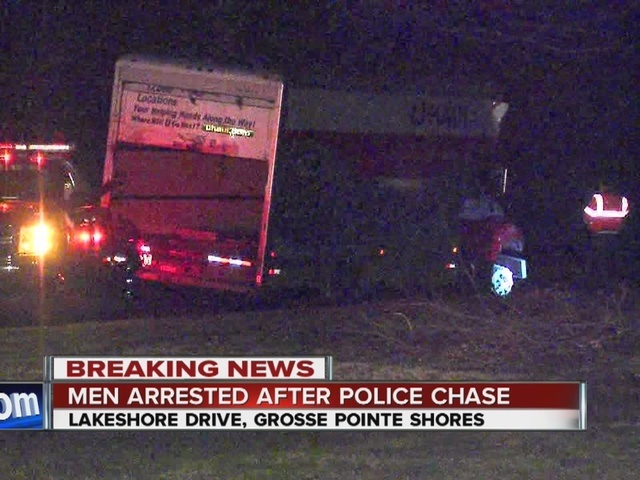 The chase started near 21 Mile and I-94 in Chesterfield Township when Michigan State Police tried to pull over the driver of a U-Haul truck, but the driver just kept going. Police tell 7 Action News the suspect kept swerving into them. We're told two troopers and one Macomb County Sheriff's Office deputy suffered minor injuries during the chase. It all came to an end in Grosse Pointe Shores on Lakeshore Drive. Inside the truck, police found tire rims that are believed to be stolen. Police say the two men have been taken into custody.